The Skomer Island Blog - Weekly News and Updates: Hidden Secrets on Skomer. With the puffins just leaving it is time to showcase some of Skomer’s other wildlife. The Hidden Secrets event is an annual event where hostel guests are invited to take part in a range of activities on the island with special access to the monitoring and research here on Skomer. This year the event ran from the 5th to the 7th of August and with a fully booked hostel it was a busy and exciting weekend. The event began with Shearwater Showcase and a visit to North Haven to meet our researchers from the OxNav group studying Manx Shearwaters. As these researchers are often nocturnal this was a unique opportunity to meet them and see their research. The group were able to meet Martyna, and watch as some of this year’s chicks were brought out of their burrows to be weighed. 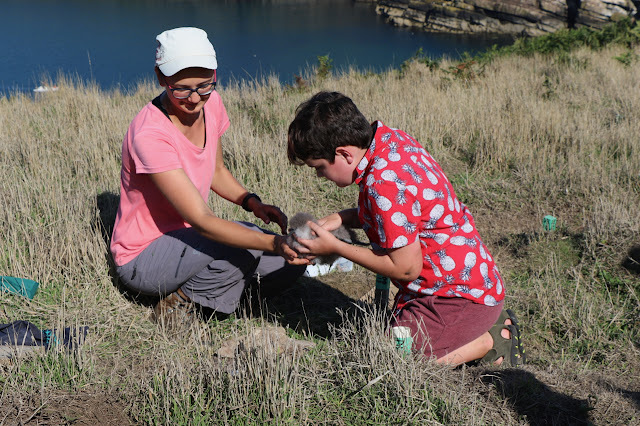 Once everyone had got a good look at a shearwater chick it was time to leave Martyna and her colleagues to continue their research and head down to North Haven beach to search for some shore life. Skomer is designated as a Marine Conservation Zone both for its seabirds and its less well known shore life. Our keen guests were determined rock poolers and we found and identified; Beadlet Anemones, Keel worms, Barnacles, limpets, an eel, shore clingfish, things that looked like chiton, and gobi. After this it was time to head back to the farm for hot chocolates after a busy day. A Skomer vole, held by one of the hostel guests waiting to be released while data is recorded by researchers. Hostel guests, Volunteeers and Staff looking through the moths trap. In the early afternoon guests were invited to take part in the Reptile Review. Around the farm sheets have been laid down on the ground to attract reptiles as they warm up in the sun and create a suitable environment. Skomer is home to slow worms, toads, frogs and lizards. Everyone gathered round the reptile sheets and the suspense built as we carefully lifted each one to reveal the reptiles. Whilst slow worms look like snakes, they are in fact legless lizards who feed on slugs and small insects but are predated upon by invasive Pheasants. Slow worms can grow up to 45cm in length and a few were discovered around this length. A few were also uncovered with unusually blunt tail ends and this is because slow worms are able to drop their tails as a distraction when they are predated. Monday evening we put the ‘Scope on Seals with our guests looking out over the Garland Stone at low tide with our visitor officer Sarah-Jay. They were treated to ten hauled out Atlantic Grey Seals, unfortunately one of these had rope wraped around her neck. Scanning out to sea also delivered wonderful views of rafts of thousands of Manx Shearwaters. To celebrate National Marine Week, each Birdlog has concluded a marine-themed fun fact and this week one of the fun facts was that Grey Seals can swim up to 32km/h or 19.8mph! The final activity of the weekend was a shearwater Discovery in the Dark and guests were lead around the island to see the adult shearwaters.